Born August 19, 1936, William “Billy” Pierce, the piano player, not the White Sox pitcher; as he used to joke to audiences, grew up in Gibson City, Illinois, a farming town. While war was raging across Europe and the Pacific, and America was still in a full economic depression, Billy worked hard on the famly farm with his dad. Displaying musical promise at a family gathering and urged by a relative (a musician), Bill’s parents purchased an upright piano. After years of piano lessons, countless thousands of hours practicing, college, and military service, Bill eventually moved to Chicago. He attended the Conservatory of Music, then set off on a career as a professional piano player. Quickly becoming a favorite with music agents of the day, Pierce was fond of saying “I never turned down a gig”. He played all kinds of jobs that other musicians wouldn’t take. He always worked. Pierce became regarded as a solid player and accompanist; consequently he attracted the attention of several of the “bigger” names in the business and worked for a period with: Martha Raye, Nick Noble and Roberta Sherwood. There were also many colorful stories he shared of late nights playing for and partying with: Robert Mitchum, Faron Young, Robert Goulet, Bob Crane, Jackie Mason, Peter Breck, gangsters and many others. Longtime pal and bassist Nick Schneider recalls Billy being a fixture, predominantly in the suburban club scene rather than at the downtown clubs. Pierce had a tremendous work ethic (no doubt owing to his childhood on the farm) practicing for hours daily, up to his final days. In his 70s he would study particular piano playing styles. At times it was Art Tatum’s classic stride piano. At one point he spent months at perfecting his performance of Gershwin’s Rhapsody in Blue. He tirelessly tackled Debussey’s Claire de Lune. For several years he even took voice lessons on Saturdays mornings. All of this dedication to his craft paid off nicely, over his career, as a hefty percentage of his income was derived from tips. Patrons loved Billy’s demeanor and musical abilities and it was obvious that he loved to perform for them. As a young married adult in addition to music, he worked various day jobs, to support his family. He sold appliances for the insurance benefits and even had a pizzeria. According to Bill the nightclub business was rapidly changing, with the drug culture of the late 1960s. Audiences were no longer listening as thoughtfully as they had done a few years prior. Seeing an opportunity, in the early 1970s, Bill formed a “hot” show band The Odyssey (still in existence today). He would later leave to start a successful wedding band (Disco band, he called it) with his wife. “We made money!” Bill would proudly say. They had bookings every weekend for years. In the early 1990s, at the insistence of friend and fellow pianist Gerry Peters, Pierce would take a job at the downtown Gaslight Club. This turned into a lucrative job for Billy and opened up new horizons. In private he, at times lamented that his playing, in particular his jazz playing wasn’t well-served with many of the gigs he took on. The trade-off was certainly his ability to earn a good living, with his very likeable persona and entertaining prowess. In the mid-90s despite having had open heart surgery, Billy played to full houses, five nights a week at the Cypress Restaurant on Ogden Avenue in Hinsdale. With his solid piano playing, ease with an audience and willingness to let others share the spotlight, his gig became a magnet for all types of aspiring singers. He figured out a winning formula. Bill would play serious solo pieces, in a variety of styles from jazz to country, from classical to Broadway (he put a drum machine to work). He would tell jokes (or stories as he referred to them) that would have the entire room howling, before seamlessly having the vocalists come up (that were seated in the audience) and perform a number. Pierce’s timing was rarely less than brilliant. Billy continued his successful act at suburban venues like Ciao Bella in Glen Ellyn and the William Tell in Countryside before returning to the Gaslight at the O’Hare Hilton in about 1999. A great gig for Billy, he made new friendships with many a weary traveler and businessmen from all over the world. He welcomed them into the Gaslight with his inviting attitude, warm smile and desire to please. He sent them home or to their next destination haven given them a slice of professional American nightclub entertaining that has become, pretty much extinct, but at which Billy Pierce was a master. Here he held down the Wednesday and Friday spots until his heart-related death in October 2016. I was one of those aspiring singers seated at the Cypress that was mesmerized by Pierce’s piano playing, humor and command of a room. I had the benefit of being called up to croon in front of those full houses, often twice, during his 4-5 hour gig. The experience was invaluable to my development as an entertainer. After the gig late night breakfasts and numerous cups of coffee kept me alert as Bill shared his rich music lore and life wisdom with me. I was an admirer, a student and shortly after, a good friend. In time as my bookings increased, Bill would occasionally come to my “important” gigs. I always derived great satisfaction from having him sit-in and do is schtick as well as play behind my rhythm section. He would “kill it” every time. I also was able to hire him a few times as a part of my trio and he always did a proficient job. years, was a perfectionist. He never dwelled on yesterday’s gig but eagerly anticipated tomorrow’s gig and receptive audience. He loved the attention. He loved the business of entertaining and made a great impression on tens of thousands of people during his 60 year career in music. He was truly one of a kind. 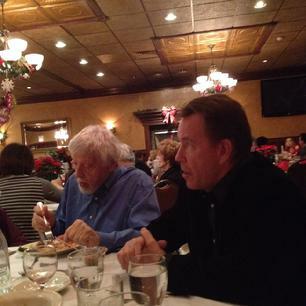 Out to dinner in the Summer 2015, Billy Pierce was asked to sit in.